Perth town centre, oblique aerial view, taken from the SSW. 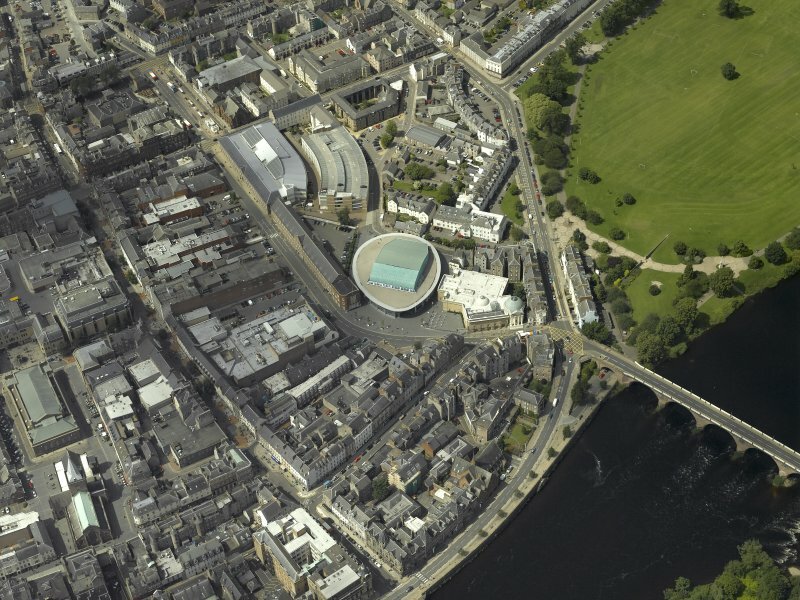 Perth town centre, oblique aerial view, taken from the SE, centred on the town centre and three bridges over the River Tay. Distant view from east of Perth. General oblique aerial view of North Inch Golf Course with the City of Perth adjacent, taken from the SSE. 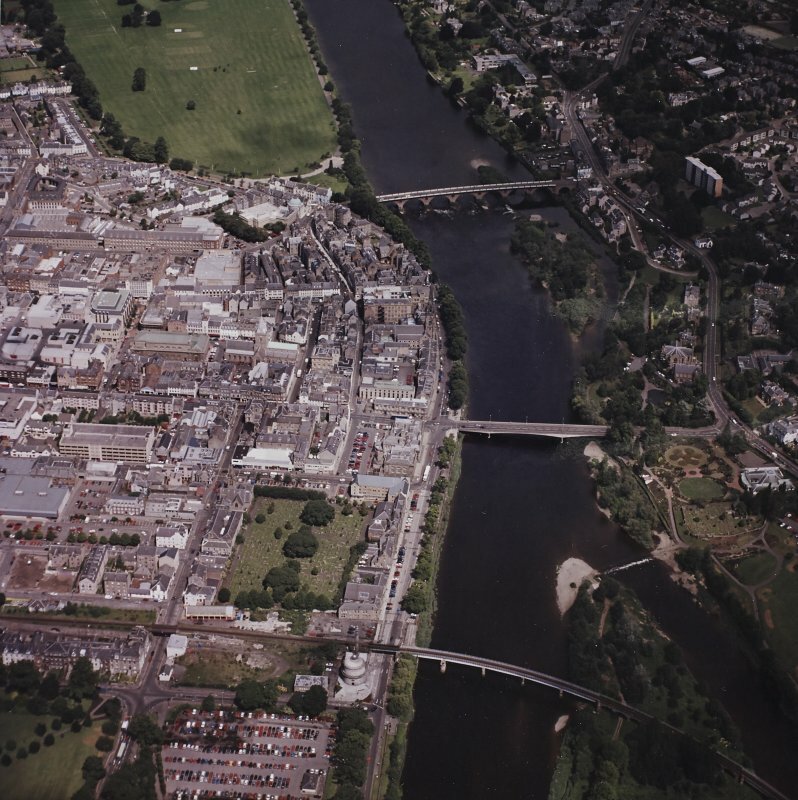 Oblique aerial view of Perth city centre, West Railway Bridge, East Railway Bridge, Queen's Bridge and Perth Bridge, looking W.
Oblique aerial view centred on the museum, taken from the SSE. Perth, general view, showing Perth Bridge and Bridgend. Oblique aerial photograph taken facing north. Perth town centre, oblique aerial view, taken from the NE, centred on the town centre. Perth town centre, oblique aerial view, taken from the E, centred on the town centre. Perth Bridge. Oblique aerial photograph taken facing north. Perth town centre, oblique aerial view, taken from the S, centred on three bridges over the River Tay. Oblique aerial view centred on the museum, taken from the SE. Location also formerly entered as NO 12118 23883 and as NO 1200 2385 to NO 1223 2392. Not to be confused with Queen's Bridge (NO 1211 2343), for which see NO12SW 264. For (adjacent and associated) Gowrie St (Kinnoull), Old Toll House (NO 1224 2391), see NO12SW 564. For (predecessor) Stanners Island Bridge (NO 1213 2372), see NO12SW 77. (Location cited as NO 121 239). Smeaton's Bridge, Built 1766 -1772 by engineer John Smeaton. A nine-span bridge with dressed-stone arch rings and rubble spandrels, pierced by circular flood-relief holes (now blocked). The segmental arches increase in size to the centre. The most northerly arch is a small semicircular one. Cast-iron footpaths were bracketted out on both sides en 1869 by engineer A D Stewart. This bridge carries the A85 public road over the River Tay between Perth (to the W) and Bridgend (to the E), and to the N (upstream) of Stanners Island (The Stanners). The river here forms the boundary between the parishes of Perth (to the W) and Kinnoull (to the E). The location assigned to this record defines the midpoint of the structure. The available map evidence indicates that it extends from NO c. 12023 23854 to NO c. 12225 23917. (Former index no. 3946). Descheduled. Information from Historic Scotland, Certificate of Exclusion from Schedule dated 31 March 2011. Two subscriptions amounting to #110.10.0 noted in the personal account book of the 3rd Earl of Breadalbane. Perth Burgh Records: T C Minutes Vol 1/1/3 Information on new lodge 1772. When built was Scotland's and John Smeaton's largest bridge. Built from 1766-71, it replaced ferries which had run since 1621, after the last bridge had collapsed. It has seven masonry arches and two land arches to provide extra flood capacity. The arches and abutments are of Perth sandstone. The peris and spandrels are decorated by rings (architectural) of stone infilled with black whinstone. Internal structure is hollow to reduce weight by use of longitudinal spandrel walls. Perth Bridge was designed by John Smeaton, better known as the engineer of the Eddystone Lighthouse and the Forth and Clyde Canal. The bridge replaced an awkward and dangerous ferry which had been in operation since the destruction of an earlier Perth Bridge in 1621. The old bridge, built in 1616, had been a low structure with insufficient room under the arches to accommodate flood water and the fIrst major flood after its erection saw its destruction. Some idea of the problem can be seen in the inscriptions on the west pier of Srn eat on's bridge. These inscriptions facing the North Inch, depict various flood levels since the bridge's construction. The river level rose 4.5m in February 1950, 4m in 1931, 5m in June 1859 and 5.8m in 1814. The problem is now reduced since the erection of the Hydro-Electric dam at Pitlochry. Smeaton was aware of these problems and, to protect the foundations, he constructed the cut-waters for the piers inside coffer dams. These can still be seen when the river is low. The bridge has nine arches with blind openings in the spandrels and a total span of 268m. On its completion there were great celebrations in Perth: copper 'halfpenny' tokens were struck depicting the bridge and the dance tune 'The Bridge of Perth' was composed in its honour. By the mid 19th century the bridge was considered to be too narrow for the traffic using it In 1869 the stone parapets were removed and iron brackets were used to support new footpaths and cast iron parapets on either side. In 1859 this became the only bridge over the River Tay to carry a public tramway system. The Perth-Scone tramway used the bridge for thirty-four years. Horsedrawn trams were used until 1905 when the servIce was electrified. The service closed in January 1929.
successor often damaged and repaired, being entirely rebuilt from 1599–1617. It is said to have had eight arches and to have been destroyed in 1621 when six arches collapsed in a flood, a disaster ascribed to the town’s ‘iniquity’. After this the river was crossed by ferries until Smeaton successfully achieved the present bridge from 1766–71. The bridge has seven masonry arches over the river and two land arches to provide extra flood capacity. The spans increase towards the central arch which is 75 ft wide. The original road was 22 ft wide, but was widened in 1869, none too elegantly, to provide the present cantilevered footways by means of cast-iron brackets and parapets. The masonry of the arches and abutments is pink Perth sandstone. Over the piers the spandrel faces are decorated architecturally by rings of stone infilled with black whinstone suggestive of transverse cavities. walls mounted on the arches supporting the roadway – a technique subsequently adopted by most bridge engineers for large masonry spans. The cavities are bridged over internally by pointed arches, with iron ties placed laterally above them to counter any outward thrust, an early application of this technique. with masonry infill extending up from the foundation to just above low-water level). These measures were based on careful site investigation and trials by John Gwyn the resident engineer, who also determined the as-builtposition of the bridge and superintended most of its building by direct labour. The cost exceeded £20 000. This 893 ft long bridge, then Scotland’s and Smeaton’s largest, now carries about five million vehicles per annum without weight restriction. On the north face of the west abutment is a record of the Tay flood levels from 1814 to the present day. span prestressed concrete structure in Scotland.